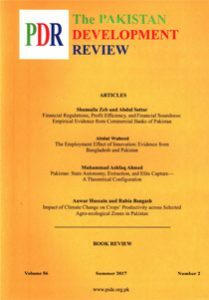 The Pakistan Development Review (PDR) is an internationally refereed journal published regularly by the Pakistan Institute of Development Economics since 1961. The journal focuses on economics and related social sciences and welcomes theoretical and empirical contributions in relevant disciplines with a particular emphasis on Pakistan’s socio-economic issues. The journal is published on a tri-annual basis. Curently the editor of the Journal is Dr. Asad Zaman while Dr. Musleh ud Din serves as its executive editor. The journal’s editorial and advisory boards consist of more than 40 renowned scholars in the fields of economics and related social sciences. They actively participate in refereeing the papers and also render valuable advice on other related matters.